Quick Take: Parks and Recreation, "Fancy Party"
Review: Parks and Recreation, "Fancy Party"
(S0309) With all of the similarities both in tone and in the little names that appear on the screen at the end of the shows, it’s hard not occasionally compare Parks and Recreation to The Office. At first, there were rumors that Parks was going to be a straight spin-off of The Office. I think we can all thankfully appreciate that that was not the case because Parks has created its own charming identity. But nonetheless, the crossover elements are still there and I found myself mildly annoyed by how parallel the Andy and April (Chris Pratt and Aubrey Plaza) courtship mirrored the Jim and Pam relationship arc on The Office, even as I for the most part really enjoyed the writing and performances at the center. So maybe that’s why it was kind of refreshing that the writers leapfrogged a majority of the early-relationship drama that dragged out Jim and Pam’s affair for, like, three seasons before they finally got married and just plopped April and Andy into a surprise* wedding, like, three episodes into their couplehood. There wasn’t much drama to be had in the episode (not even sitcom drama) other than a brief protest by Leslie (Amy Poehler) that April and Andy were jumping into marriage to quickly, but those moments were quickly squashed by Ron Swanson (Nick Offerman) who reminded Leslie that love works in mysterious, unpredictable ways. He himself was married three different times (to two different Tammys) and did so much later in life, and none of those relationships worked out (AT ALL). So who’s to say April and Andy don’t know what they’re doing. The rest of the episode was a fun “let’s-see-what-each-character-is-up-to” extended party montage that was just fun to watch. While April and Andy were exchanging their appropriately apathetic/goofy-optimistic vows, Tom (Aziz Ansari) tried to get credit as the Best Best Man, Ron explained the best way to burn an effigy of one’s ex, Jerry (Jim O’Heir) wore a stupid shirt, and Chris (Rob Lowe) creeped out April’s goth friend Oren by having the polar opposite personality as him. Each of these sequences had many great comedic moments, as rushed of subplots as they were. Speaking of rushed plots, just as Chris’ return to Pawnee as the new City Manager came as an out-of-left-field narrative device that doesn’t really make much sense to get Rob Lowe back in the day-to-day picture, Ben (Adam Scott) himself has been offered a random job (by Chris) to stay in Pawnee too. 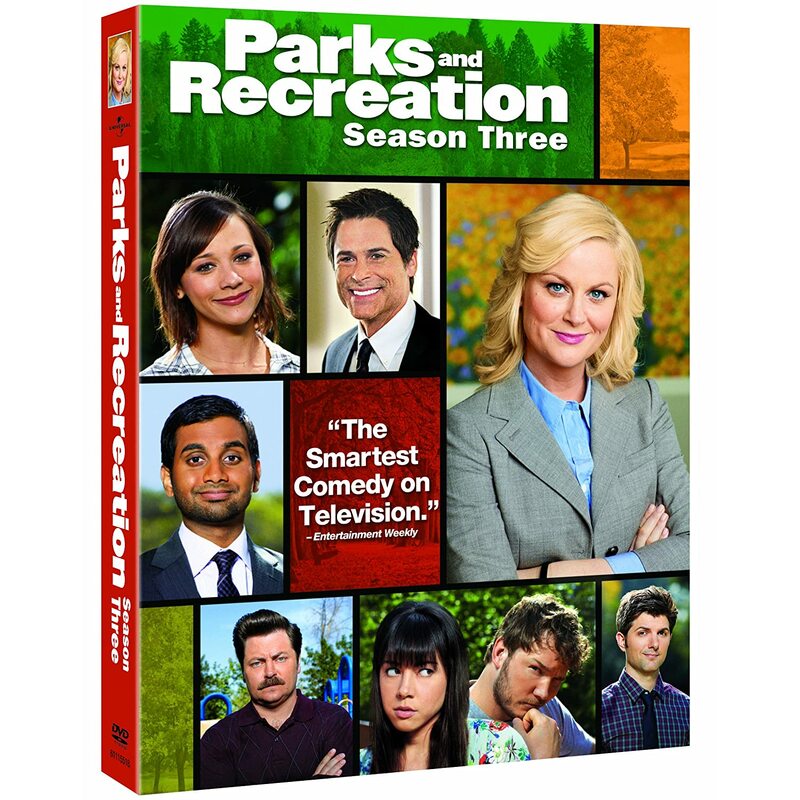 It’s a head-scratching move, but Parks and Recreation has built up enough good-will with me that I can ignore the over-convenience of it all. Anyway, Ben asks Leslie if he should stay or not, clearly trying to gauge how she feels about him. And surprise sur-freaking-prise, they do secretly like each other and Ben stays. And maybe that’s why the writers rushed April and Andy’s marriage: they knew that they have a new Jim-Pam relationship on deck. Unceremoniously absent from the wedding were Ann and Donna, who both separately attended a Singles Night at a local bar. I really like the direction the writers are taking Ann’s character this season. Rashida Jones has played a very capable straight-person over the last two seasons so it’s nice to see her manic, insecure, comedic side as well. So were a little bride and groom placed on top of Chris’ vegetable loaf? Chris had some, um, interesting dance moves. Early on I thought about Parks & Rec in terms of how similar (or different) it was from The Office. And while there are obviously still many similarities in terms of style and tone, I don't relate to each other at all these days, except perhaps in terms of Parks & Rec clearly being in its prime and one of the very best comedies of this new decade, whereas The Office is at this point a lumbering warhorse trotting stolidly into the sunset.